The Survivor moves from one Zone to the next but cannot move through external building walls or closed doors. If there are Zombies in the Zone the Survivor is attempting to leave, he must spend one extra Action per Zombie to leave the Zone. Entering a Zone containing Zombies ends the Survivor's Move Action, even if he has a Skill that allows him to move through multiple Zones per Move Action (or the Slippery Skill). EXAMPLE: Silas is in a Zone with two Walkers. To leave this Zone, he spends one Move Action, then two more Actions (one per Walker), for a total of three Actions. If there had been three Zombies in the Zone, Silas would have needed four Actions to move. You can only Search building Zones and only if there are no Zombies in the Zone. The player draws a card from the Equipment deck. He may then place it in the Survivor's inventory or immediately discard it. A Survivor can only perform a single Search Action per Turn (even if it's an extra, free Action). After searching, the Survivor may freely reorganize his inventory. Remember, you may discard cards from your inventory to make room for new cards at any time, for free. When the Equipment deck runs out, reshuffle all the discarded Equipment cards (with the exception of Vault cards like Inferno and Orcish Crossbow, but including starting Equipment cards) to make a new deck. 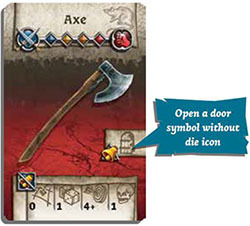 Melee weapons with the "Open a door" symbol can be used to open a door next to the Survivor. 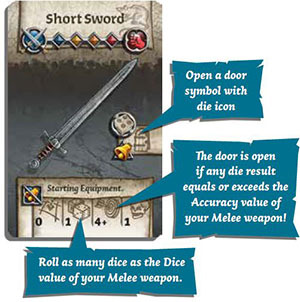 Spend an Action and roll as many dice as the weapon's Dice value: the door is opened if any die result equals or exceeds the Accuracy number of the weapon. Place a Noise token in the Zone. note: Opening a door is not a Melee Action. It doesn't benefit from Dual wielding, Melee bonuses like Skills or Daggers' extra bonus die. Only the raw Dice value of the weapon is used. Some weapons have the "Open a door" symbol without a die symbol on it. They can be used to open doors without the need to roll any dice. Just spend an Action to open the door. A Noise token is placed if the weapon is noisy. Many Quests feature colored doors. Usually, these cannot be opened until some conditions are met, like finding an Objective of the matching color. Read the Quest description to know more. Opening a closed building for the first time reveals all the Zombies inside all rooms of the building (a single building extends to all rooms connected by openings, sometimes straddling several tiles). 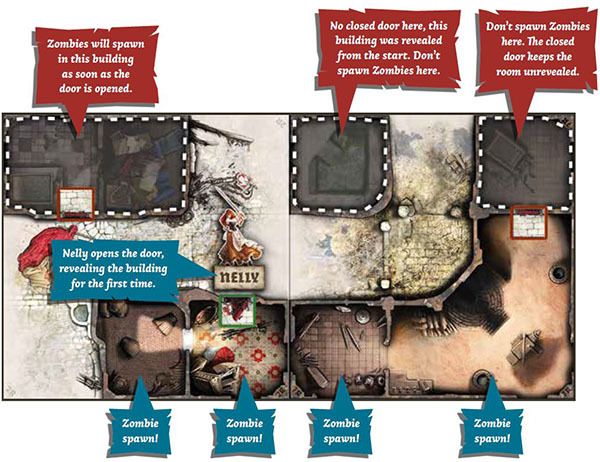 Indicate each Zone of the building, one after the other in any order you choose, and draw a Zombie card for each Zone. Place the corresponding number and type of Zombies on the indicated Zone. If you draw an Extra Activation, immediately perform the action indicated on the card. If you draw a Double Spawn card, don't spawn Zombies in this Zone, and spawn two cards' worth of Zombies on the next. Some game effects allow an open door to be locked up. If it is opened again afterward, it won't trigger a new Zombie Spawn. Buildings that are open at the start of the game are never spawned in. At the cost of one Action, a Survivor can reorganize the cards in his inventory in any way he wishes. The Survivor can simultaneously exchange any number of cards with one (and only one) other Survivor currently in the same Zone. This other Survivor reorganizes his own inventory for free. A Trade Action doesn't have to be fair; you can trade everything for nothing, if both parties agree! Combat Actions use all types of combat-oriented Equipment cards: Melee, Ranged or Magic. The Survivor uses a Melee weapon he is holding in Hand to attack Zombies in his Zone. The Survivor uses a Ranged weapon he is holding in Hand to fire at a single Zone within the Range shown on the weapon's card. 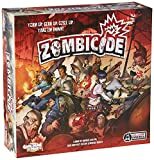 In Zombicide: Black Plague, people shoot at Zones, not Actors. This is especially important for Targeting Priority Order. Remember, using a Ranged weapon at Range 0 is still a Ranged Action. The Survivor uses a Combat spell (a spell with combat x characteristics) he is holding in Hand to attack Zombies. This attack follows the same rules as Ranged Actions. The Survivor uses an Enchantment (a spell without combat characteristics) he is holding in Hand. Resolve the game effect(s) described on the card. 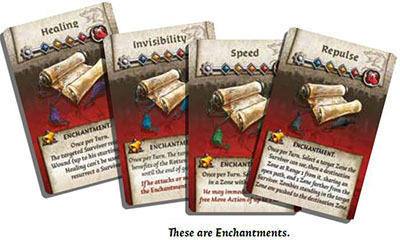 Enchantments are cast at target Actors or Zones (check the card description) within the Survivor's Line Of Sight. If the target is a Survivor, the caster may target himself. Most Enchantments bear the note "Once per Turn": a given Survivor can cast it only once during each of his Turns. If he owns multiple copies of the same Enchantment, each copy can be cast independently. The same Enchantment can be cast several times in a Game Round, if Survivors exchange it and cast it as their Turns go by. The Survivor takes an Objective or activates an Objective in the same Zone. The game effects are explained in the Quest's description. The Survivor makes Noise in an attempt to attract Zombies. Place one Noise token in his Zone. The Survivor does nothing and prematurely ends his Turn. His remaining Actions are lost.